Genius Games set to launch Kickstarter for periodic table board game this Tuesday, September 18 – AiPT! Regular readers of AiPT! Science know we’re big on the board games of John Coveyou and Genius Games. With previous releases including subject matters like chemical bonding and cell biology, Coveyou has decided to back to basics for the next game, using the periodic table itself as a game board. Launching on Kickstarter this Tuesday, September 18, Periodic: A Game of the Elements combines pick-up-and-deliver elements with set collection, and a slick and elegant design typical of previous Genius Games offerings. Genius Games Brings Periodic: A Game of The Elements to Kickstarter on September 18th! You may remember the periodic table from your high school chemistry class. But imagine that you didn’t study it – instead, you played a fun board game designed around it with your friends. Odds are you’d remember a whole lot more about the periodic table! And Genius Games, an award-winning, St. Louis-based board game publisher, is willing to bet on that. In Periodic, you strategically activate periodic trends (such as “increasing atomic mass”) to speed across the periodic table, collecting elements to score points. As you move across the board, you’re also racing to end your turn in specific element groups, competing with opposing players to earn the limited bonus points! “This game was really a no-brainer for us,” says John Coveyou, head designer and founder of the company. “Everyone has to learn about the periodic table, and it’s a crucial body of knowledge that serves as a springboard to a deeper understanding in so many fields of scientific inquiry … but it’s often hard for students to see all that behind the utilitarian-looking grid! With this game we’re bringing back the elegance that the traditional textbook leaves out.” And, as hundreds of playtesters have affirmed, it’s actually fun. Coveyou has taught chemistry in the classroom from grade school through college. He began tinkering with games as a way of demystifying science concepts for his own students, who often gave up on science as “hard” or “boring” before class even began. Dissatisfied with the quality of educational games on the market, he started designing his own. Coveyou believes well designed games can draw even the most reluctant students into the inherent beauty and dynamism of the natural world. Genius Games has already won accolades from scientists and gamers alike. Previous games have won the Seal of Approval from The Dice Tower, the oldest and largest board game review channel on Youtube. They’ve clinched endorsements from the International Journal of Cell Science and the National Science Teachers Association, as well as features in The Wall Street Journal, Scientific American, Gizmodo, and Geekdad, among others. Their products are used by teachers in classrooms around the world and are currently printed in six languages. 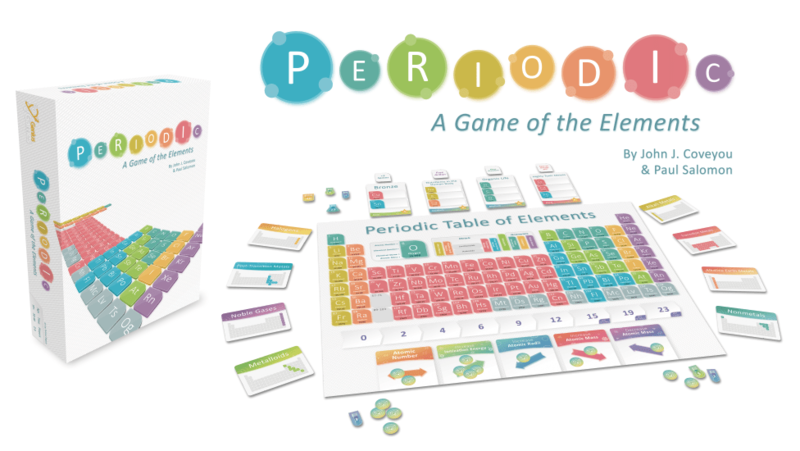 Periodic: A Game of The Elements is designed for 2 – 4 players and will be available for an MSRP of $39.99 following the Kickstarter this fall. Genius Games, a St. Louis-based board game publisher, was founded by John Coveyou in 2014. Genius Games publishes high-quality, science-themed tabletop games that are both entertaining and educational. For more information, please visit GeniusGames.org. John Coveyou, creator and designer of Cytosis: A Cell Biology Game, nearly dropped out of school in his teen years and spent a stint living out of his car. After serving in the military, he pursued his love of science at Washington University and earned his Masters in Energy, Environmental and Chemical Engineering. He later quit his posh engineering job to launch Genius Games in 2014. He now teaches courses on Game Design and Crowdfunding at Webster University in St. Louis along with running Genius Games full time. Periodic is the eighth science-based game created by Coveyou. He has successfully completed nine Kickstarter campaigns, raising a total of over a million dollars in funding.